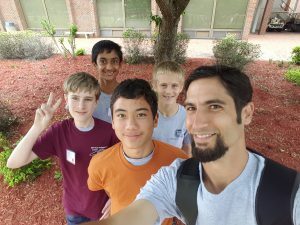 Congratulations to our four students ( Varun Varajaradan– 7th grade, Mason Evans – 7th grade , Charlie Flynt– 7th grade and Sebastian Gebauer -8th grade who competed and excelled at the state level of High School Math Contest at Fayetteville State University on May 4. These four students qualified at the Annual Southeastern Regional High School Math Contest at Coastal Community College in Jacksonville, NC on April 6 by placing in the top 10%. On May 4, these four students competed with high school students in Math 1 and Math 2. 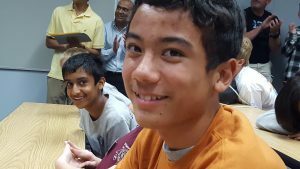 Varun Varadarajan placed 4th in Math 1 and Mason Evans placed 8th in Math 2. Charlie Flynt and Sebastian Zagler had an impressive showing as well. To put this in perspective, our 7th graders earned this high ranking while competing among high school students! Certainly, this speaks well for our students and Mr. Simon! In fact, on April 6 Mr. Simon won the Math 2 Coach of the Year Award for how well our Math 2 students performed in the Regional Competition! Congratulations to all!